Many of us relish the sights and sounds of the farm during summer and autumn – children giggling and playing with the chickens, families picnicking on the hillside, farmers zipping around the farm harvesting veggies, and the excitement of bringing an armload of fresh produce back home for dinner that same night. But have you ever wondered what happens in the wintertime? 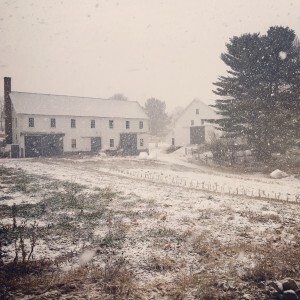 While activity certainly slows down at Wright-Locke, by no means is the farm “asleep” for winter. 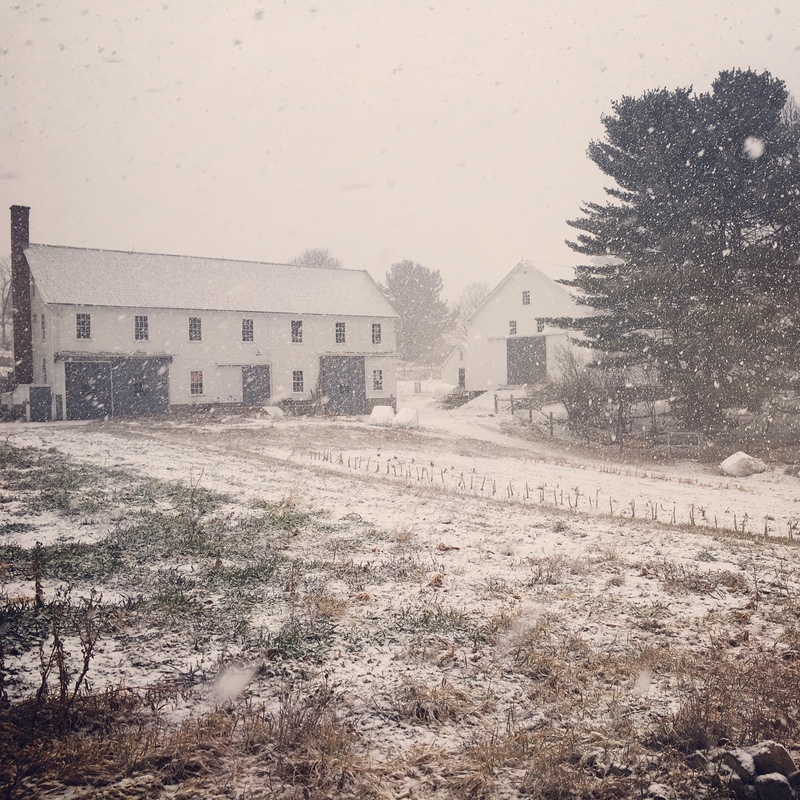 So much of the farm’s success is based on what happens during the winter months, so we wanted to give you a glimpse of what goes on here when it is (or should be…) cold and white. November: We’re wrapping up programming with a couple last Farmer’s Markets, the Thanksgiving Market, and a charity trail run! In the beginning of the month we plant garlic to over-winter for next year (that’s right, it just sits tight in the ground until spring!) Now is the time that all of our irrigation and tools get tucked away for winter. 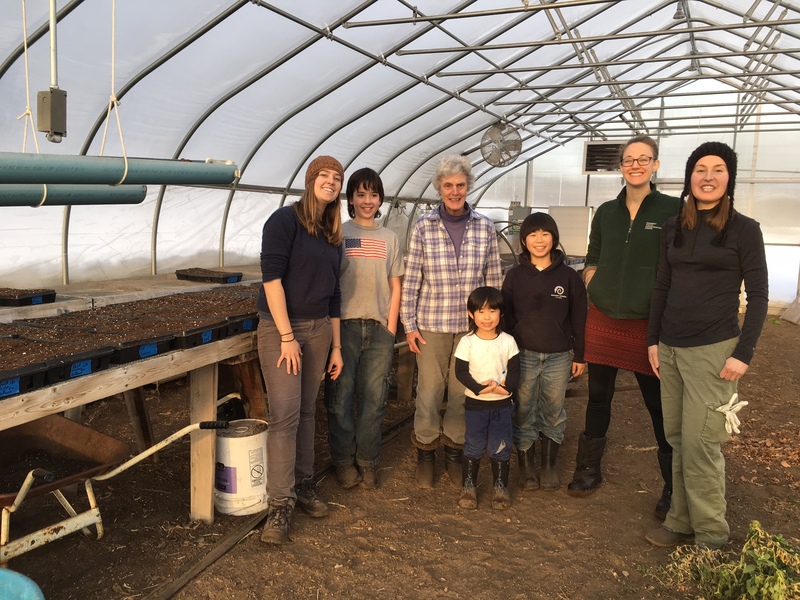 Now, some farms continue to grow food in high-tunnels (long, tall greenhouses) year-round, but we only have one small greenhouse and not a lot of extra land to build on, so we stick to the traditional growing season. 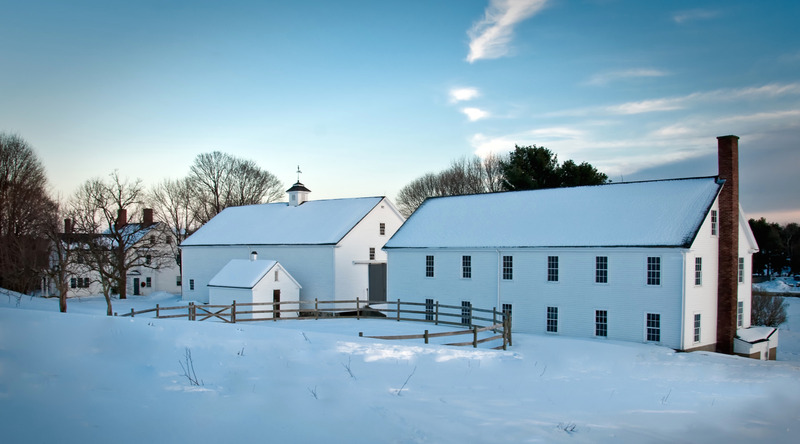 Our events and education programs also wind down for winter because our historic buildings cannot be heated (don’t worry, though, we’ve got some ideas for the future). 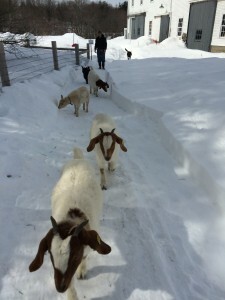 By the end of the November, we have already come up with a volunteer schedule for goat and chicken chores. That’s right, our critters stay outside all winter-long, but don’t worry, the goats and chickens have a lot of fluff to keep them warm. Our volunteers and staff make sure (twice a day, everyday!) that they have food and water and that their shelters are accessible…you should have seen how much shoveling we needed to do two years back. December: Our farmer goes into planning mode and lays out where every single crop is going to be planted next season. She calculates how long each row will be, how many seeds are needed for each variety of each crop, and then takes a full day or two to order seeds. 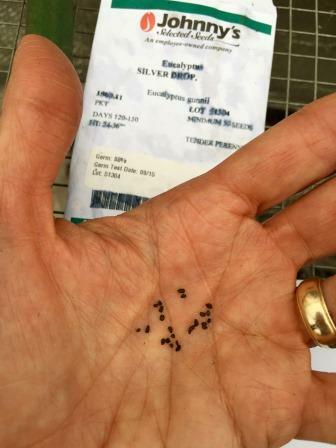 Hopefully, all of the seeds will arrive in the mail by March…when we start back up in the greenhouse! In December, we also produce our annual printed newsletter and send it out to the entire community – it’s a great way to look back on the exciting happenings from the past year. It also requires a dedicated effort from the entire Wright-Locke team – all of us ended up with sore fingers and dry tongues from all the paper folding and envelope stuffing we did. January: We all jumped right back in after the holidays with staff and committee meetings – planning for another busy and successful year. Rebekah, our Education Director, works tirelessly to set up all of our education programs and book instructors for our adult workshops, not to mention making sure that online registration is ready to go from a technological standpoint. And Amy, our events manager, has already booked much of the calendar for the upcoming year! Coordination and communication is key at Wright-Locke because we all share the same spaces for all of our programming – keeping everything straight between us all really becomes a well-choreographed dance. January is both a month of planning as well as a month of connection. Because we are always trying to figure out ways we can be more involved with the community, Kim, our Community Engagement Manager (and Farm Stand Manager) has been talking with groups and individuals interested by the opportunities offered by our unique farm. 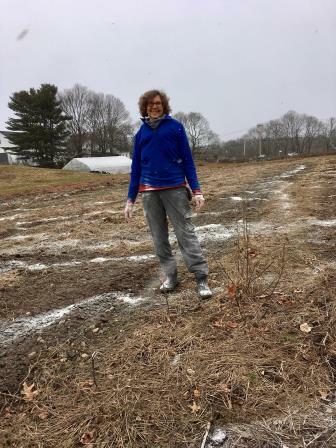 She is excited to bring more new faces, ideas, and good energy to Wright-Locke Farm. February: In the dead of winter, it can be hard to believe it will ever be spring again, but one thing that reminds us of the season to come is our baby chicks. We add to our chicken flock every year, and we partner with interested families to raise baby chicks in their homes. This keeps them safe while they grow, and then we add them to the flock at the end of spring. It’s pretty heart-warming to see the children who raised these chickens come visit them at the farm to see them grow big and start laying eggs. But back to February! All of us at the farm make sure to front-load as much planning as we can in the winter months because, come May, it is “GO GO GO!” up until November. We take these months to plan any building projects, figure out event logistics, hire seasonal staff, and make sure we are all communicating efficiently. Of course, we all know that on a farm, we need to expect the unexpected and I am always amazed and thankful for how well the Wright-Locke community acts as a team to overcome the unexpected. 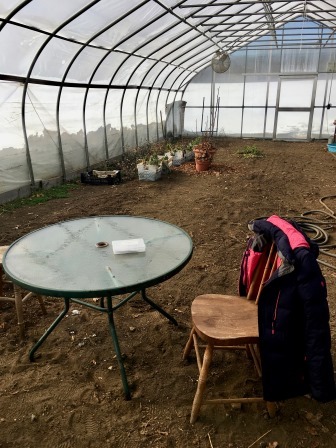 March: At this point in the season, we have turned on our greenhouse and have started most of our onions, shallots, kale, spinach, and beets – they will be the first plants to get transplanted in the fields due to their temperature hardiness. Kim has been hard at work in the farm stand, talking with local vendors, creating training materials, ordering product, and reorganizing the stand. In May the farm stand will be open for regular hours, however, our eggs are available every Wednesday throughout the winter via an honor box system (Thanks once again to our chicken chore families!) 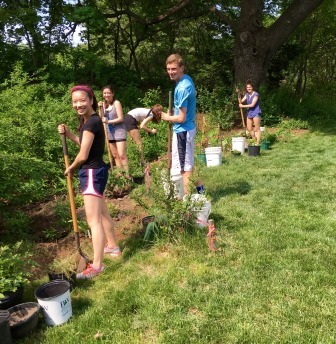 In March, we also host the NOFA (Northeast Organic Farming Association) Bulk Order Pick-Up. This means that we receive, sort, and help distribute a huge amount (about 20 pallets worth!) of farming materials that farmers in the region have ordered. All these farmers save money by ordering together and hosting the pick-up is a great way to serve the local farming community. April: By April, most of our staff is back on site and new staff members are being trained. We are gearing up for things to take off. As we wait to start tilling the fields, the greenhouse starts getting really crowded with all of the eager seedlings. 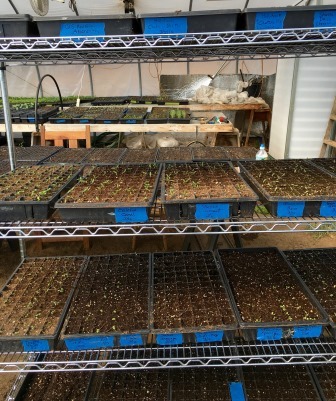 And speaking of seedlings… the farm fills up again with our youngest members as our April Vacation Youth Programs get under way. April is also when our adult workshops start up. This April, we are looking forward to our Flower Arranging and Mushroom Growing workshops. 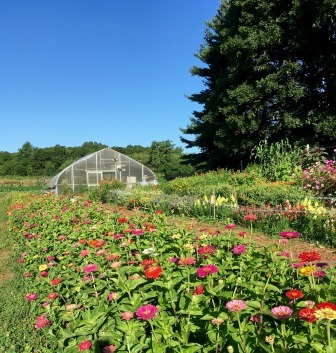 By now, it thoroughly feels like spring and the farm is buzzing with energy and new growth, a truly invigorating feeling, and one that is very rewarding after the long, cold winter.